Grease slowly builds up in the drain pipes due to the type of detergents used or draining extremely oily stuff down the kitchen pipes. It is a common problem in most homes. Having blocked drains is horribly frustrating, and often leads to considerable expenses, stinking and broken pipes. If not resolved these can cause extensive damage to your overall drainage system. Best drain cleaner for grease - Greased drain pipes slows, or blocks the flow of dirty water entirely; causing overflows and may eventually burst pipes if the grime is too much. There are numerous solutions on how to drain your clogged pipes. But, it’s critical to understand how your ducts accumulate grease, and how it can be a potential problem if overlooked. • Grease is oil based. It either comes from oil products such as meat, milk, or fried food stuff. Grease also emanates from the body products we use daily like hair products and body lotions. • Anything consumed or used in our homes may contain a sizeable proportion of grease. Even cautious individuals may not notice as oil flows into the drain pipe. • Kitchen pipes consist of the highest fatty elements that flow through the drains. • Bathroom grease comes from oil-based showering gels, detergents, and soaps. Because of frequent use of all these substances, it leads to a gradual buildup in your drain pipes. • Homes with more than three individuals in a family are more prone to quick grease accumulation in the pipes due to the regular use of kitchen and bathrooms. 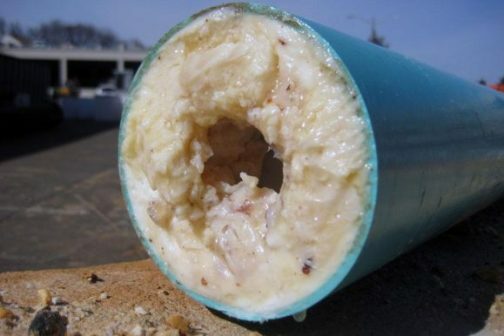 • The fats emulsion flows into the drain pipes causing frequent blockages and bursts where the system is weak. As the old proverb goes, “prevention is always better than cure”. Avoiding the buildup of fat in your drain pipe is the best way to accomplish grease-free drain pipes. We have outlined some key preventive measures to avoid you can use unwanted fat oils from clogging your drainage pipes. The most efficient ways to prevent waste from clogging up the pipes is to filter out food left over’s and fatty liquids before flashing out your wastewater into the drain. Wipe your plates, pots, and pans before washing them to remove the extra grease. After wiping, you can use warm water to clean the oil-free utensils to prevent excessive grease from flowing into the drain pipes. Grease mixes up with debris in most cases. Hair, food leftovers and dirt forms layers that collect grease in the pipes as time goes by. Drainage stoppers and mesh traps grab any fragments that might bring clogs in your drain. Always make sure that these stoppers are detached and cleaned to keep away bad odors in your bathrooms and the kitchen. It is crucial to maintain your drain system often. Constantly check your pipes, like twice every three months to spot any appearance of grease buildup. Once a year, you may engage the services of a professional plumber to inspect the entire drainage system in your house. The spot checks prevent further clogging and timely detection of unwanted grime that may lead to potential grease clogs. Troubled pipes brew up into blocked channels when you notice slow drainage of water in your pipes. You may find it easier to melt away grease by use of hot water when cleaning your dishes. It helps in part but makes the grease to stick in the drain pipes. After some time, the grease layers get thicker and thicker, eventually slowing the overall flow of dirty water into the drain pipes. It is better to mix hot and cold water when cleaning your utensils or when taking a shower. This way, you grime flows through instead of accumulating once it reaches the bottom of the drainage system. It may create a bigger problem than a clogged pipe if the amassed grease settles in your septic tank. If you formed a habit of using tools to remove unwanted fat, whenever you spot some, this significantly improves your drainage systems. Alternatively, you could also regularly run hot water through the kitchen sink or shower just to clean the pipes. Do this for 5-10 minutes using high-pressure water. Regular removal of grease stuck in pipes is the most efficient method to eradicate oily stuff off of your drain pipes. Grease comes in many forms as we have seen above. The secret to maintaining and avoiding greasy pipes is always to be mindful of what you throw into your sink. It is better to control and prevent having blocked pies than trying to find a solution to unclog extremely messy drainage pipes. Regular cleaning goes a long way.